Your name is Mr. X. Your mission, if you choose to accept it, is to escape London. Sounds simple, doesn’t it? But be forewarned, you will have 5 of London’s finest detectives hot on your trail. If they catch you, the gig is up! Expect no help from any fellow spies; you are on your own. 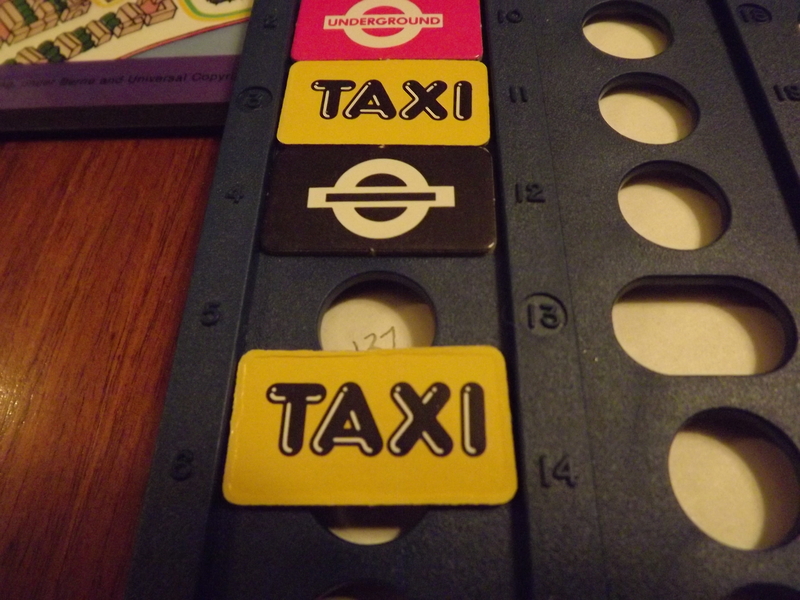 Don’t get taken away to Scotland Yard! 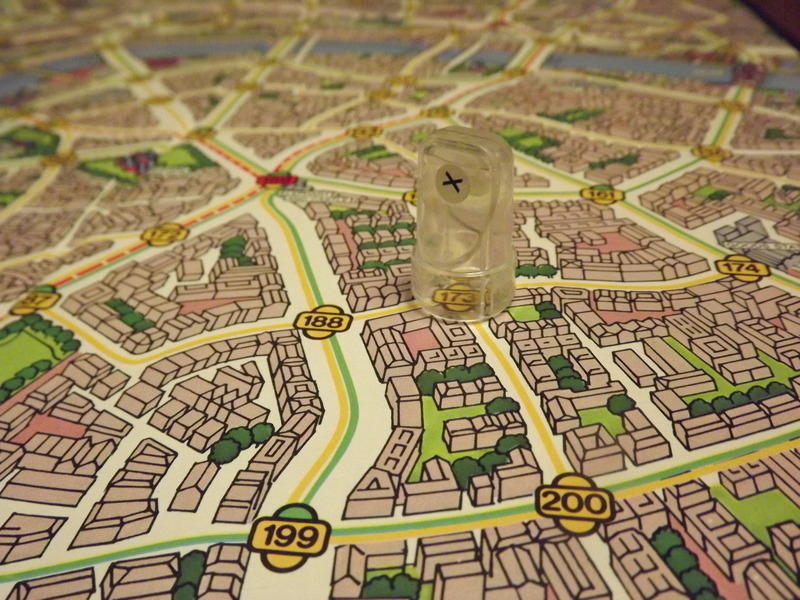 In Scotland Yard one player is Mr. X and the other players are the detectives sent out to locate and capture him. 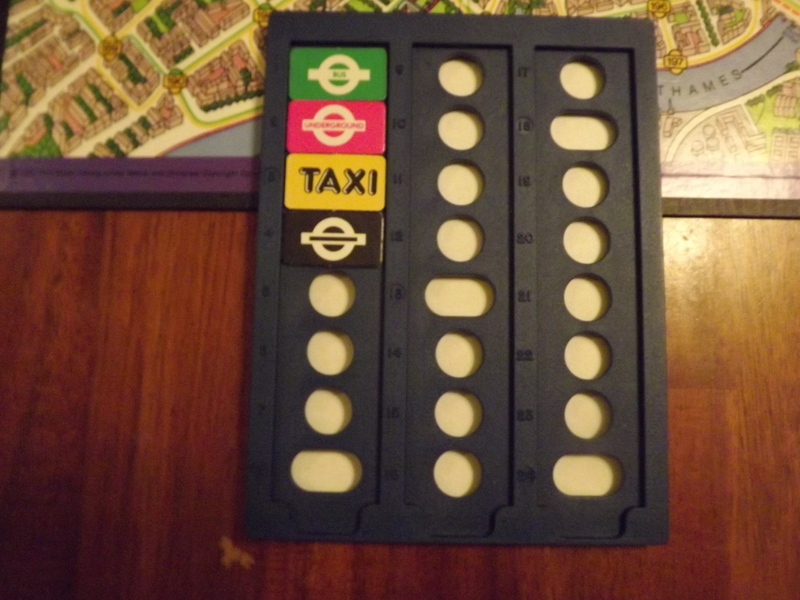 To do this each detective is given cab tickets, bus tickets and underground tickets. Where Mr. X gets the same as well as some black tickets and double move cards that can be used to hide or make two moves in a row respectively. Mr. X moves first per round. He writes the destination of his next move in the log book and covers it with the ticket he used. He must surface after his 3rd, 8th, 13th, 18th and 24th moves by making his move as normal and then placing his pawn where he is located. After Mr. X has moved, the detectives make theirs. They can move wherever they wish provided they have a ticket and follow a route. To do this there must be a connecting line of the right service and a stop at that location for them to be able to move there. Only one player can be at any station at any time, so the detectives must work together to not block each other off. The detectives then give the ticket used to Mr. X, and once a detective runs out of a certain type of ticket, they cannot use that service again. At the end of the game the detectives win if they are on the same location at any time as Mr. X, or Mr. X wins if he evades the detectives until they run out of tickets after 22 turns. 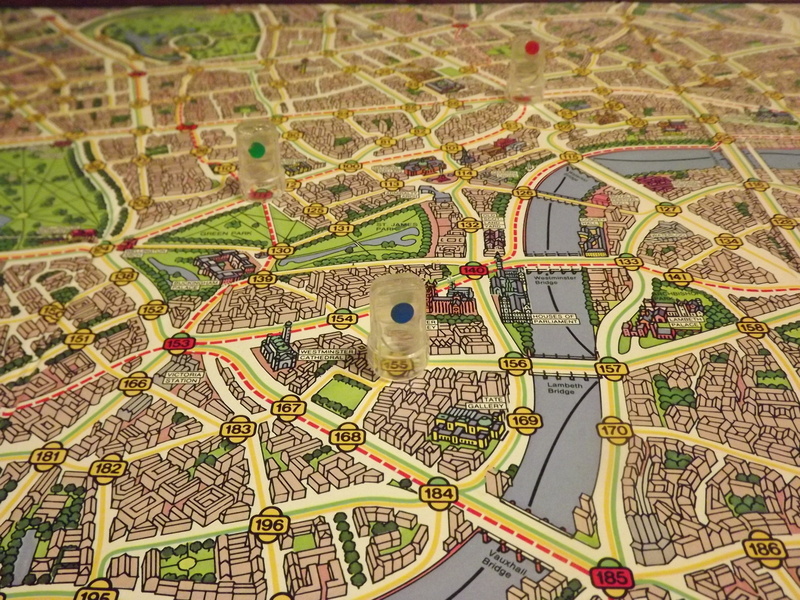 Plain and simple Scotland Yard is a game about deduction. The scope of it is fairly simplistic, so it is very accessible. Thanks to a quick learning curve, the game is easy to pick up and teach to others! It involves both movement programming on the side of Mr. X and deduction with cooperation on the detective’s side, so there is something for everyone to enjoy. If you have someone in your group who isn’t too familiar with tactics and strategy, they can play as one of the detectives and still have a fun experience working with the others. The rules do state that it is a game for 3-6 players, but since you use all the detective pawns regardless of how many people are playing, you can easily make this a one on one game. I actually prefer it that way! The detectives…are they closing in??? Families with younger children will be able to play this without a problem, as Mr. X can actually make the game as challenging or as easy as they deem fit. By programming their movements to allow the detectives to “catch up”, it can be as fun and fast paced, or as intense as you wish it to be. Plus, by being semi cooperative one parent could be Mr. X and the other could help the younger detectives of the group as much as was needed. An added bonus to the game play is the amount of social interaction required by the detectives to program how they will trap Mr. X and not hinder each other in the process. They have to pull together and coordinate their efforts in order to achieve a victory, as one small slip can result in defeat. You are kept engaged throughout, even when it isn’t your turn. With its cat and mouse aspect, the game has everyone on the edge of their seats and thinking regardless of who’s turn it is. 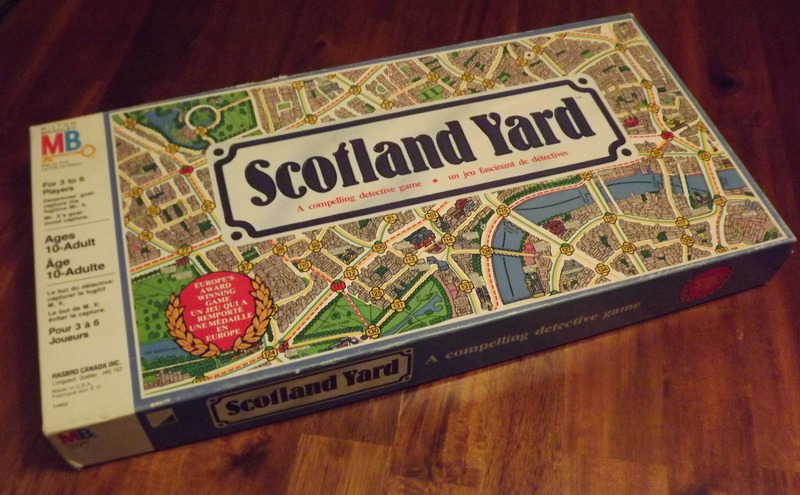 One thing that Scotland Yard does very well is it creates a nice intense atmosphere. The detectives have to be careful where they move and how they move in order to trap Mr. X. Mr. X’s tension comes from seeing the detectives closing in on them from all sides. It can create an extremely fun and nail biting experience! The battle to outwit one another can create some very high tension games. Since the game involves as much of a player’s personality as well as their gaming style, it has a great re-play value to it. No two games will be the same, so you can play it multiple times without getting too bored. However, some more experienced gamers may find it too simplistic and it may be better suited as an introduction for gamers with little experience, or even as a gateway game to shift them into something more than a roll and move type of game. It can also be used as a jumping point for other games of this type such as, Fury of Dracula, and Letters from Whitechapel. Since the game is only as good as the people who are playing it, it can suffer from those who are into this style of game, or who don’t care much to throw themselves into the experience. Playing the detectives isn’t nearly as fun as playing Mr. X in my opinion, but if you try it with just two players it can be. I also found that sometimes it can be a bit on the boring side if Mr. X is revealed to be on the other side of the board and you just have to use your next couple of movements to get anywhere near where he once was! Being cooperative also means that it can be dominated by an alpha player, but this comes down again to your group’s personality and not the game itself. I have never had an issue with one player dictating to the others what and where they should go. It has always been an open conversation to deduce where Mr. X has been travelling. 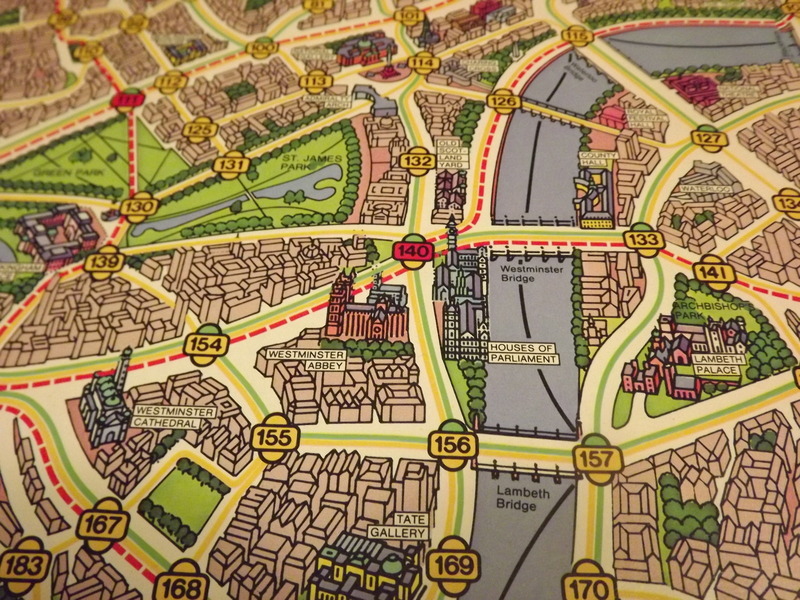 Scotland Yard is a wonderful introduction to deduction and movement planning style of games. It is short and easy to grasp, as well as providing an intense environment. Difficulty can easily be customizable, which makes it perfect for families or people looking to get into the genre. More experienced gamers however should probably look at Fury of Dracula or Letters from Whitechapel as something with a bit more strategy to it. I have fond memories of this game and it is one that will always hold a special place in my heart. Easy gameplay with small learning curve. Good introduction to deduction games. Can be as difficult or simple as you want it to be. Simple gameplay may be too simple for some. Personality of players may ruin the experience. Board is hard to read.